«Production of sulfuric acid from copper-nickel ore is unprofitable, but we are going to do it because we are not only working here, we are living here,» says Alexey Tyukin, Technical Director of Kola Mining and Metallurgical Company. Sulfur dioxide (SO2) pollution from the factories near Russia’s border to Norway in the north has for decades been a thorn in the relations between the two neighbors. With more than 100,000 tons of SO2 emission annually, the two factories in Zapolyarny and Nikel have caused severe damage to the fragile nature and boreal forest in the area. Now, emissions are dropping. At least the sulfur dioxide emissions. With new technology for processing the ore in Zapolyarny, changing from roasting to briquetting, SO2 emission is down from 42,000 tonnes to 1,400 tonnes per year as previously reported by the Barents Observer. Previously, a third of the sulfur in the concentrate became sulfur dioxide when burned in Zapolyarny and went out the chimneys. Now, that sulfur remains in the briquets when sent to Nikel for smelting into fernstein (nickel matte). 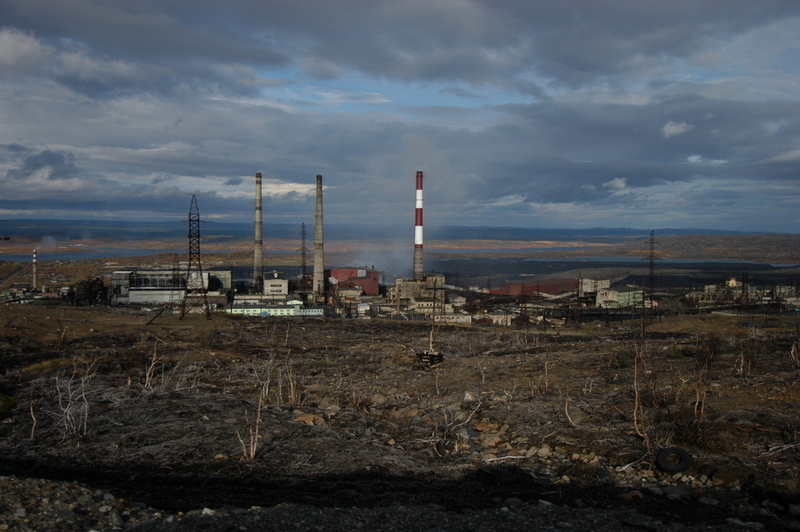 As a consequence, air-pollution from the smelter in Nikel went up, something also reported in the 2016 annual pollution report by the Ministry of Natural Resources and Ecology of the Murmansk Region. Then, according to Kola Mining and Metallurgical Company, more sulfur in the briquets and more sulfur dioxide in the smoke, actually makes it easier to recover more of the sulfur dioxide in the converters. Talking to regional media about the new process, Technical Director Alexey Tyukin, says it is possible to increase sulfuric acid production from 600 kilo per ton smelted fernstein previously to now 800 kilograms. Interviewed by regional Murmansk GTRK, Tyukin says «from more sulfur-rich briquettes in the course of melting and converting, the more sulfur-rich gas is obtained.» Without mentioning the amount of production, the TV news showed film of at least 14 tank-wagons for sulfuric acid on the rail-track at the smelter in Nikel. The company says sulfuric acid production is not a profitable business. «The prodiction of sulfuric acid from copper-nickel ore is unprofitable, but we are going to do it because we are not only working here, we are living here,» Tyukin says in an interview with the regional newspaper Murmanski Vesti. The sulfuric acid production plant in was commissioned at the factory in Nikel back in 1977, but has not been much up an running. The production process is now being modernized. NOTE TO READER: After this new story was first published, NorNickel posted a link to this article on its Facebook page and could inform that the company had produced 9,300 tons sulfuric acid more than planned for the period January to July this year.